With a rainbow-colored array of fresh vegetables included in this Balsamic Chicken & Vegetable Stew, it’s high in fiber and a great source of lots of other nutrients. Sweet balsamic vinegar and aromatic fresh basil are added at the end of cooking, which really make the dish pop! 1. Heat oil in a Dutch oven over medium high heat. Sautee onion and garlic for 2-3 minutes, until softened. Add in tomato paste and cook 1 minute. 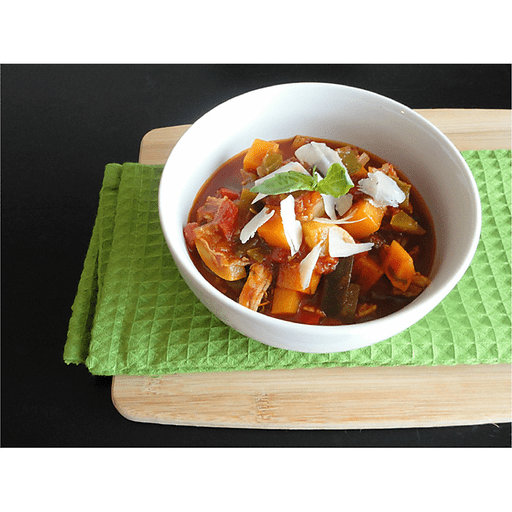 Stir in chicken broth, diced tomatoes, crushed tomatoes and dried seasonings along with chopped vegetables and sweet potatoes. Bring up to a boil, then cover and simmer for 25-30 minutes or until vegetables are tender. 1. Stir the balsamic vinegar, chopped basil and cooked shredded chicken back into the stew. Heat through until chicken is hot and flavors have combined, about 5-10 minutes. Serve immediately. Try using red bell pepper, green bell pepper, zucchini and summer squash for your assorted vegetables. Serve with a garnish of fresh basil and shavings of parmesan cheese. Calories 200, Total Fat 3.5g (Saturated 0.5g, Trans 0g), Cholesterol 35mg, Sodium 550mg, Total Carbohydrate 24g (Dietary Fiber 6g, Sugars 11g), Protein 17g, Vitamin A 200%, Vitamin C 100%, Calcium 8%, Iron 15% *Nutritional values are an approximation. Actual nutritional values may vary due to preparation techniques, variations related to suppliers, regional and seasonal differences, or rounding.